Coed Varsity Bocce · Jan 16 Magruder fell to Springbrook 2-0. Coed Varsity Bocce · Jan 11 Magruder fell to Blake 2-1. 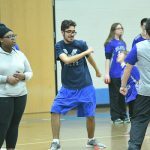 Coed Varsity Bocce · Jan 4 Magruder fell to Paint Branch 2-1. Coed Varsity Bocce · Dec 18 Magruder defeated Sherwood 2-1.